From 1983-1988, the Nob Hill landmark Fairmont Hotel played the title role in the ABC television series Hotel, based on the novel by Arthur Haley. Known as the St. Gregory in the Aaron Spelling series, this was the setting for romance and drama that swept through the lives of the hotel's staff and celebrity guests. Like The Love Boat, this was an anthology series featuring a museum of semi-retired television and film stars. Even Bette Davis got into the act, as St. Gregory owner Laura Trent in the pilot episode. Starring James Brolin, Connie Sellecca, and Anne Baxter, whose Victoria Cabot character took over the matriarch role from Davis. Film buffs will note that Baxter played the conniving Eve, who takes over Bette's life in 1950's All About Eve. 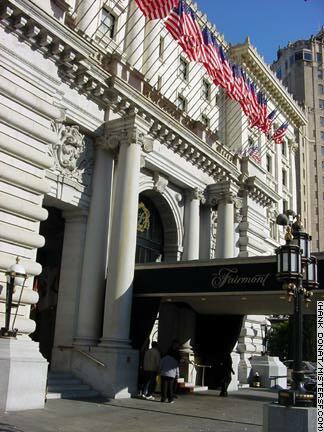 As the St. Gregory, the Fairmont also made cameo appearances in the Spelling/ABC series Dynasty, a fan favorite and camp classic shown at gay bars in the Castro throughout the 1980s.